We get a lot of questions from readers about the raku firing process. I think raku firing intrigues many a potter because of the drama involved in the process. How cool is it it to take a red-hot piece out of a kiln, see the molten glaze and hear the pings from the thermal shock. Oh, and then there’s the flames! Who can resist the flames? To give you and idea of the great stuff that is packed into it, I am posting an excerpt today. It is a common misconception that potters must use glazes specifically formulated for raku in a raku firing. 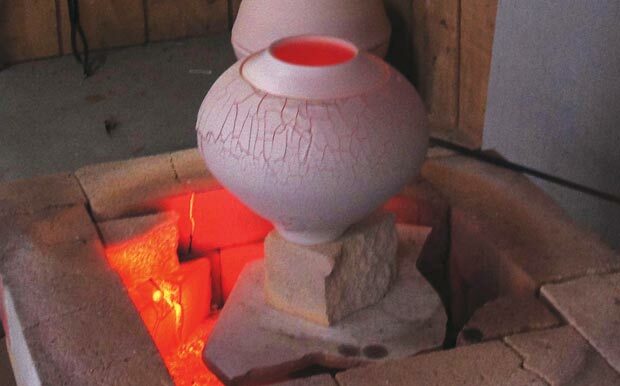 But as Steven Branfman explains in this feature, you can use virtually any glaze in the raku process – from commercial to homemade, and low fire to high fire. – Jennifer Poellot Harnetty, editor. In my workshops, I get asked many questions but never “What is a raku glaze?” Why? Because everyone knows what a raku glaze is. Right? It’s a glaze that is labeled “raku.” Wrong. It’s time to expand your thinking and understand exactly what this whole raku glaze thing is about. A raku glaze is any glaze you use in the raku method. It doesn’t have to be a glaze specifically designed for raku, formulated to fire at the temperature you fire your raku to, nor homemade or commercial. It can be most anything. The key to success is understanding the raku firing process and the ability to predict how a particular glaze reacts to that process. Raku, as practiced in the West, is a low-fire method in which we quickly heat the ware, remove the ware from the kiln when the glaze has melted, and perform some type of post-firing process to the piece. The post-firing phase is usually an immersion in an organic combustible material to affect the final outcome on the glaze and the raw clay. Deciding when the glaze has melted takes practice and is best done by observation, though many potters use pyrometers to aid in making that decision. Raku is exciting, often unpredictable to the novice, and fun to do. Raku fired pot with brushed stoneware glaze under clear raku glaze, by Steven Branfman. Glazing work for raku can be done by all the methods known—dipping, pouring, brushing, spraying, splashing, dripping, sponging—you name it. Glazes also can be used alone or in combination. Keep in mind that the application of a glaze has a direct effect on the result. Glazes specifically designed for raku fall into two categories: homemade and commercially prepared. If you mix your own, you’ll find scores of recipes. Search the internet, ask friends, look in any book on glazes or raku, and look in magazines. In no time you will find more glazes than you could use in a lifetime. Of course, to mix your own glazes you must have a stock of materials, mixing paraphernalia, knowledge, and interest. If this doesn’t turn you on there are myriad manufacturers that produce almost as many raku glazes. The advantage of using commercial glazes is that you are given instruction on how to use the glaze, you have a sample of the fired glaze to help guide your results, and the formulation (although not the results!) will be consistent time after time. Of course, commercial glazes are a bit more expensive than mixing your own. Glazes used in the raku process need not be “raku” glazes at all. At its core, raku is a low-temperature firing method. The fact that we remove the ware from the kiln while the pots are hot and the glaze is molten is irrelevant. Understanding this opens up a whole new world of glazes. Any glaze that’s formulated to fire at the low temperature of raku can be used. First, you must decide at what temperature you are firing. 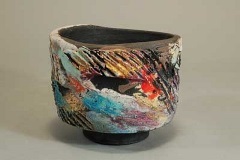 Most raku is done in the cone 010–06 range. Begin by choosing glazes that both appeal to you in color and that fire in your range. You will have to experiment but I have never found a glaze that I couldn’t use successfully. We are not limited only to glazes that melt at the low temperatures. With greater understanding of the raku process, even mid-range and high-fire glazes can be used in the low-temperature range of raku. Try using your regular stoneware glazes as slips. Over the glaze, apply a clear or white raku or other low-temperature glaze. The low-temperature glaze causes the high-fire glaze to melt giving you a new palette of colors to work with. In addition to glazes, slips, engobes, underglazes, overglazes, china paints, underglaze pencils, oxides, and stains are all viable in the raku process. No matter what type of glaze or decorative material you use, raku is inherently unsafe for use as domestic ware. The rapid firing, removal of the ware, and subsequent post-firing phase all contribute to fragility, porosity, and thin, easily flaked glaze surfaces. Not all materials used in raku glazes are toxic. In fact, most are not. Confusion arises when you realize that over the centuries some of the most prized teabowls by tea masters have been raku fired. Be safe, and think of your raku ware as decorative and not functional. clay, high fire, low fire, mid range, resist, spraying, stoneware, thermal shock, underglaze engobe. We have gerstley borate….The real deal…and lots [tons] of it. Can anyone point me to a sealer for the inside of vases that I am raku firing? I don’t plan to put water in them, but in case someone purchases one, I would like it to hold water. responding to Richard’s comment about the transience of copper colours: I beg to differ. I have pots with beautiful copper lustres that I made 1989-93 that still look like the day they came out of the pit. *Some* lustres *may* fade — but it is not a given. I want to say a couple things. First, if you could get a hold of Robert Piepenburgs book on Raku and Steven Braunfmans book on Raku that would be helpful for many reasons.To answer your question on oxides, you can use those that you mentioned and many more. You can mix small amounts in base glazes and test to see the results. You can mix with water to make washes and brush them over (or under) clear and white glazes. I found that reading those two books gave me plenty of foundation to build on for experimentation. If you want to make your own glazes you just have to do a lot of testing. The problem with Raku is that there are so many variables. You can get many different results with the same glaze just by firing it differently or reducing it differently. There are really no cut and clear answer to your questions. You just need to do some reading and do a lot of testing and experimenting. I have a vase which was fired and glazed to cone 6.Can I refire it in a raku kiln with application of raku glaze,or without? I was wondering if charcoal or wood fuel could be used for firing a pot or jug with a salt glaze and have it still come out a white or light color? Thanks Judy (from sunny queensland)for respondind to my message–but i am afraid i didn t make myself quite clear! When i refer to “oxides” i mean raw stuff, i don t mean mixed with glazes! So, can i use just oxides– E.G.,IRON,BLACK,RUTILE(on terra siggilata- treated surface)?? Even if the materials of raku glaze are not toxic ( whether you may be talking about food safety or ceramics practice safety as well), the porousity of the raku ware, the fragiulity of it’s craqueled glaze and the porousity of it’s body make it more decorative than functional. Even for a flower jar, you don’t want it to let the water and moisture pass to the table were it stands. Katherine, while it’s true that raku teabowls have been highly prized in the tea ceremony in the past, modern concerns about the porosity of the clay body and the crackle glazes used in modern raku increase the possibility of contamination in the food contact surface. To make a food-safe surface, you can add an additional step to the process by glazing the food surfaces with a food-safe low-fire glaze and firing the work, then use raku glazes on the outside of the piece and finish with post-fire reduction. I was disappointed in Steven Braufman’s comments about food safety and raku glazes. He sort of contradicts himself by telling us that most of the materials in a raku glaze are not toxic, and that some of the most prized teabowls used by the ancient masters have been raku glazed–certainly indicating that they were used successfully. Then he closes by telling us that we should think of raku as decorative and not functional. Whayt gives? How could these prized teabowls have been used wiithout problems, while Mr. Braufman tells us that raku is not functional? I wish he had gone into some detail to tell us why he feels that raku is not and cannot be modified to be used functionally. Incidently, I have been using a raku glazed wine vessel for years without problems. Gersley Borate is not that easy in states either. Currently I am using Laguna Borate as a substitute. However I seem to remember from when the mine firs closed that one of the substitutes was Colemanite imported from Turkey. That should be available in Greece. And as for those beautiful effects of copper flash it is possible to preserve them if sealant is put on piece reasonably soon after firing. I am using some spray from art store designed to block moisture and ultraviolet light. There are couple of different brands and they do come in both gloss and mat. The first piece I sprayed is now two years old and the colors had not significantly changed in spite of my proximity to beach. Alkaline and borax frits are great to use. Alkaline frits will give your glaze fine crackles while borax frits give more impressive large crackles. I measure oxides with the other raw ingredients by weight. I apply my glaze with as big a brush as is practical for the size and detail of the piece. Apply your glaze to your bisque fired piece – but make sure all the water from the glaze has dried out before placing it in the kiln for firing. Not sure about the substitution for gerstaley borate. I still have a small amount which I ration out. This is a(rather desperate) voice from Greece. Since i intend to start dealing with raku ( I ve done a lot of reading ,by the way, but ,Alas, it seems that i am getting more AND MORE confused……xexexexex) I HAVE SOME SIMPLE QUESTIONS AND I REQEST ANYBODY S GOOD WILL TO SHED SOME LIGHT ON the matter. HENCE, ANY APPROPRIATE SUBSTITUTE FOR THIS–APART THE RATHER INAPROPRIATE COLEMANITE THING — which i believe is rather difficult to handle–some call it a monster! 2. How do I mix various oxides and how do i apply them (way and stage)?? Any response on the above , greatly appreciated ! You have it somewhat backwards. The process of firing raku was originated by the Koreans and imported by the Japenese. It was the Japenese, whose tea masters raised the aesthetic of raku to it’s heights by useing the process to produce wares for their tea cerimonies. Originally, the process consisted of firing small pots in a small charcoal-fired kiln, and allowing them to cool in the air by placing them on a stone or brick outside the kiln. No reduction, or smoking, was done to the pots. When the process was introduced to America – with the publication of Bernard Leach’s “A Potter’s Book” in the early 1940’s – raku was considered an ‘alternative’ firing process that potters might want to try for it’s variety of effects, and the immediacy of results. Legend has it that a potter, in the 1950’s (quite possibly a well known potter of the time) was trying out this process, and, by accident, placed the pot in some dried leaves that were on the ground. The resultant smoke, combined with the effect of ‘reduction’ on the pot created some effects that the potter noticed and liked, and so, developed further. This was the begening of the contemporary, “American” raku technique that we all know and love. Since those early stages of development, many advances have been made, as well as some quite spectacular glaze formulations with very dramatic effects. None of which, I might add, have much in common with the original “raku” as the Japanese knew it. I would be remiss if I did not also state that, in my opinion, some of the effects, and some of the glazes that are being used, and sought- after through the raku firing process, are very short-lived and should be discougaged rather than encouraged. I am speaking, of course of the ‘copper-flash..Copper-luster..iridescent..oilslick..dry matt’ glaze effect, that, while amazingly bright and colorful, with an incredible “Wow!” effect, WILL NOT LAST on the surface of the pot. A few years, six or eight at the most, and the colors will fade. period. It has to do with re-oxidation of the reduced copper molicules. Keeping the pots out of sunlight may reduce the speed of the re-oxidation, but it will not stop it, and any coating over the finish that is strong and thick enough to halt oxygen fron getting to the surface will, by itself, change the color of the copper film; and you would have to coat the inside of the pot with the same thick coat to stop the permiation of air through the wall from the inside. I say this, because it hurts all of us trying to make a living by doing raku to have someone dissatisfied with a purchase that has changed so dramatically in a short period of time. When they hear that a piece is ‘raku’, they will/may automatically shy away from another purchase, whether it has that same glaze on it or not. Hang in there,.. I’m pullin’ for you,.. we’re all in this together. This is one of my favourite firing processes, and I am inerested now to try some of the high-firing glazes underneath. Thanks for the ideas. Jenny. I am curious about the original raku technique done in Japan and imported by Korean potters. What are the differences in process and materials? Were the tea bowls more functional than ‘American’ raku is now? Thanks to all who have contributed here I have enjoyed reading now I am prepared to commit to practice. Steve is always a wealth of information…I have been lucky enough to do a workshop or two with him. 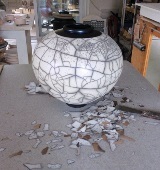 My own work consists of mainly decorative pieces;Raku, Pit Fire, Horsehair. I love the different techniques and results. I will now play with some low fire glazes…Thank you Steve.